One of the most popular and well-received anime series is Death Note. It follows the story of a brilliant and intelligent high school student named Light Yagami who stumbled upon a mysterious notebook called the “Death Note.” Since this is one of the most popular anime series, there are a lot of people that want to dress up like the characters. To help with that, this article will be a Death Note Cosplay guide. Now, the two main characters of the series are Light Yagami, the protagonist, and L, the antagonist. The story centers around the two of them and their duel of wits and intelligence. Light plays Kira, the one who is killing all the criminals, while L is the main detective tasked to find the true identity of Kira. 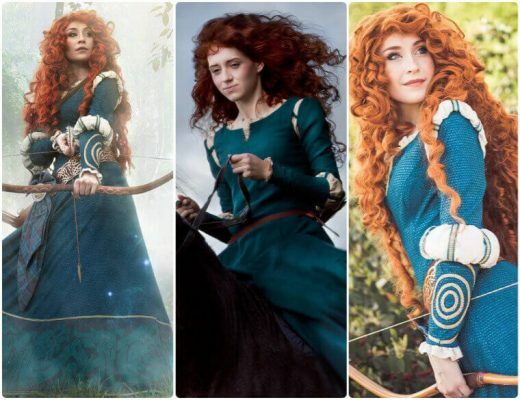 Cosplaying the two characters won’t be hard, considering the outfits they wear is very distinct. 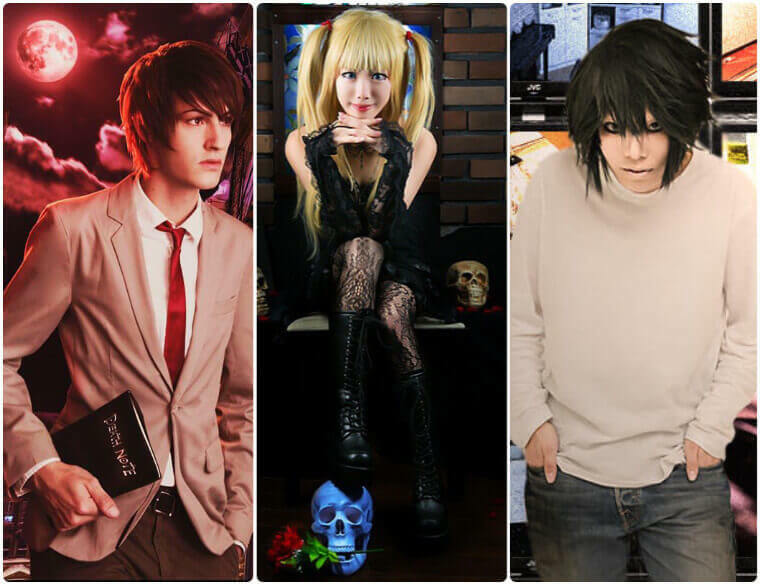 For female cosplayers, there’s no need to fret since the Death Note series also has a prominent female character, she’s Misa Amane, the female Kira. Unlike the two male characters, Misa has worn a lot of different outfits throughout the anime series. But there is an outfit that is well associated with her. Let go through the detail costume DIY guide for each character. Light Yagami is the main protagonist of the Death Note anime series. He is a hardworking, talented, and a natural genius teen. He is very organized, good at solving problems, and perceptive. Light is also the person behind the Kira identity, who kills criminals using the otherworldly Death Note notebook. Cosplaying this character is not that hard, considering Light is shown mostly wearing his school uniform. 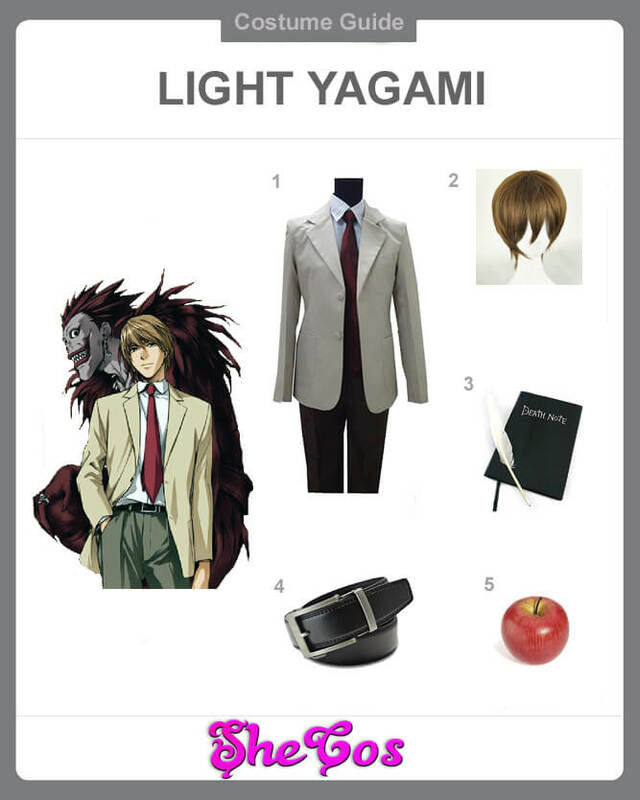 This Light Yagami cosplay set will come with the full costume, which is his school uniform. The uniform is a light brown coat with white long sleeves polo, maroon necktie, black slacks, and black leather belt. The set will also come with a short light brown wig for Light’s hair, the Death Note notebook with a feather pen, and a plastic apple. The plastic apple is the food Light gives to Ryuk, the Shinigami who owns the Death Note. Light Yagami is a genius student who is well-liked by his peers and his family members. He also has a strong sense of justice like his father. This strong sense of justice is the reason why he wanted to rid the world of criminals after he stumbled upon the Death Note. What started out as a quest for justice, though, became much more sinister, as Light started to view himself as a god because of the notebook’s power. This ruthlessness made some viewers consider Light as the antagonist of the series instead of the protagonist. Despite his evil nature, you will never really see it in his appearance. Light is a handsome and well-dressed individual that looks more like a model citizen than a ruthless killer. 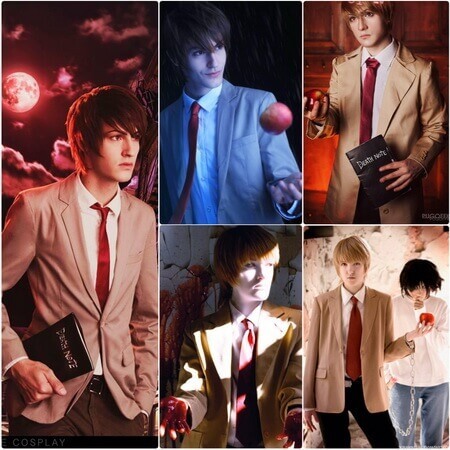 If you look at the cosplay photos, you can see that dressing up as Light Yagami is like transforming into the perfect individual that can do no wrong. L Lawliet is a very well-known detective around the world. He is known to be someone who is capable of solving even the most complex and challenging cases with his intellect and great deduction ability. He was brought on to solve the Kira case, pinning him directly against Light Yagami. Despite being the antagonist of the series, L is a fan-favorite character. You can even consider him to be more popular than Light. Dressing up like him is not that hard, considering he only wears one outfit. He is also a direct opposite of Light when it comes to his appearance as he usually projects himself to messy and unkempt. The cosplay set will come with L’s full costume. This will include a white long sleeveless shirt and blue jeans. The set will also come with a short messy black hair, representing L’s hairstyle. 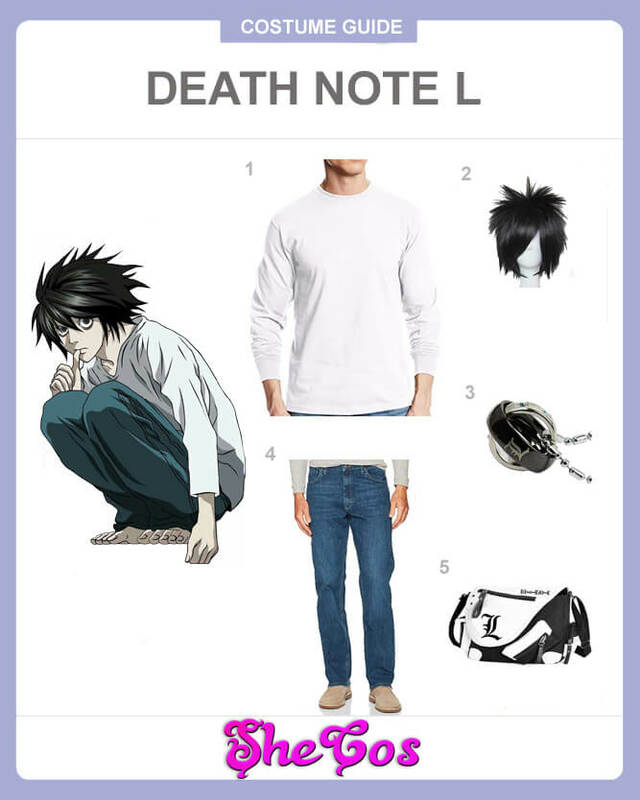 This L death note cosplay set also includes a double ring rotatable necklace and an L shoulder bag as accessories. Like Light Yagami, L is also a genius person who is very perceptive and good at analyzing situations and planning for them. The series usually showcase how the two geniuses try to outsmart each other in a battle of wits. Light tries to cover his tracks and keep his identity secret, while also trying to learn L’s true identity in order to kill him. L, on the other hand, tries his hardest to uncover Kira’s true identity, while also keeping his own secret. L’s unique characteristics and odd appearance actually make him a fan favorite in the Death Note series. You can even say that he is more popular than the main character Light Yagami. Dressing up as L is not hard, considering how simple his appearance is. 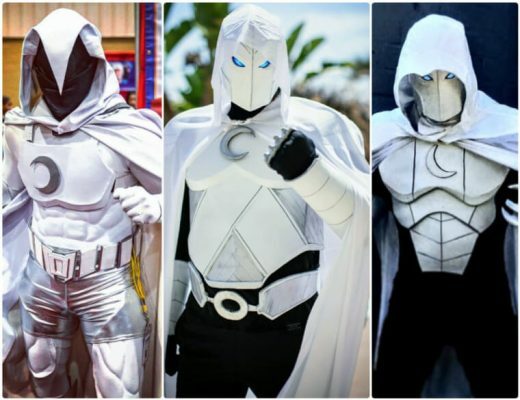 But if you look at the cosplay photos, you can see that his simple appearance will still leave a lasting impression to anyone who sees him. This is also a reason why a lot of people want to dress up like him. Misa Amane is one of the avid supporters of the persona Kira. She’s such a big fan that she herself became the second Kira, also possessing a Death Note of her own. Her big difference with Light Yagami is that she traded her eye for Shinigami Eyes, allowing her to see the names of people. This also allowed her to ID Kira as Light Yagami. 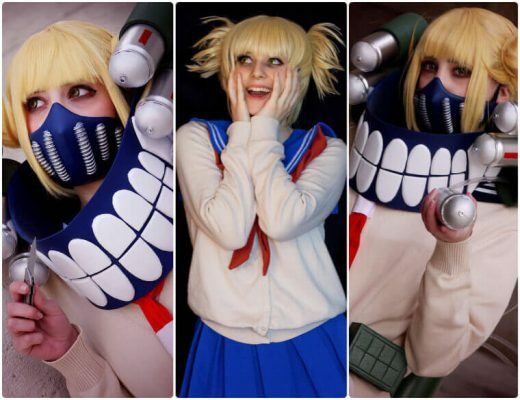 Misa wore several outfits throughout the series, being an up and coming model and all. But her most recognizable outfit is her Gothic and Punk Fashion. For this Misa cosplay set, you’ll get the black spaghetti strap dress that has white lines near the end of the dress. It also comes with elbow-length fingerless lace gloves, knee-length lace stockings, and black boots. 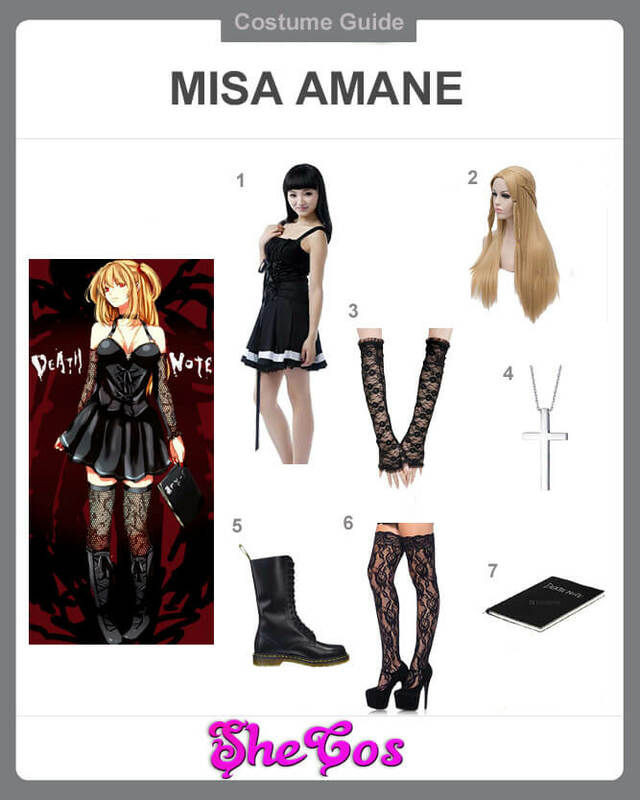 To complete the outfit, the set also comes with a long blonde wig for Misa’s hair and a cross necklace. For the accessory, you will be getting a Death Note notebook. As a big fan of Kira for killing the criminal who murdered her family, Misa set out to find the true identity of Kira. With her possession of the Death Note and the Shinigami Eyes, it was easy for her to track him down and discover his true identity as Light Yagami. After meeting Light, she decided to dedicate herself to finding the true identity of L to help eliminate him. Misa is an up and coming model, which means she is pretty and very fashionable. However, her choice of Gothic fashion is more in line with her activities as the second Kira and the possessor of a Death Note. Despite the Gothic look, cosplaying as Misa still looks chic and fashionable. If you look at the cosplay photos, you can see how beautiful and chic Gothic look can be with the right combination of outfit and makeup.